Crochet for Baby or Babyhæklet as the original title is, a book by Sys Fredens. This book is now out of print in Norwegian but I borrowed it at the library to see if it was a good book and since I was busy making baby gifts I thought it a good place to start. Also small things are fast and fun to do and might suit me rather well as I am always starting something new. Well I opened the book and loved it. 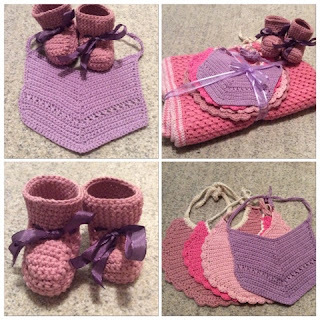 14 patterns which included; baby booties, bib, body, wrap around top, jacket, dress, another jacket, short trousers, dress with sleeves, hooded jacket, trousers, "devil" hat, blanket and driving pouch. All in all a good set of things a baby needs I thought and started looking into finding and purchasing the book for myself. But when I started actually reading each pattern to see which one I wanted to crochet and what yarn I would need, the yarn I found out easily as there was a section at the back but I struggled with the patterns. Usually when I read a pattern I understand it and can wizz through but in this book it did feel like certain key tidbits of informations was missing. When I try out a pattern I like the pattern to be easily read and well written, I don't want to wonder if I am supposed to crochet in the round or back and forth, I don't want to wonder if I start at the top or bottom and things like that and in this book I felt a lot where up to guessing... I asked my mother who has been a crocheter all her life and she could not understand the jacket pattern either. I felt discouraged and put the book down. 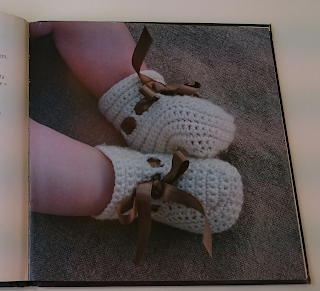 It had looked so promising, and a baby book with crochet in Norwegian is hard to come by. I wanted to try again and felt betrayed by the author and her beginning words in which she talked about her patterns as easy... But I started anyway with the baby booties. Aren't they adorable? And sure they look really easy. But looks can deceive, I started out and did a row at a time, and surely after three rows my sole looked like a V., this can't be right I thought but I continued on and after reading the whole pattern again I decided I was doing it right since the pattern said the sole and heel needed to be sewn at the end. But I still think that would have been better said more plainly at the start. Ok, carry on. When I got to the top of the feet I struggled again and did not understand anything and after crocheting and ripping and doing over I decided it might be right and just continuing again. Then I did the ankle and I didn't know if I was supposed to continue back and forth or do it in the round but did both and the round seemed better so I stuck with that. In the end I spent four hours on one but the second went by so much faster although I am still not sure if i did it right after the pattern. And number two is slightly bigger but oh, well. They are still adorable. In my finished blogpost of the booties I used Drops Paris which was not the suggested yarn, but luckily in this pattern it is stated how big the sole should be in cm for each size which was very helpful. The booties weighed 45 grams with bows. The second one I did in a couple of hours so I am sure a good crocheter can make a couple in a night. I am not sure if the size of the book 15x15 cm made it so that the patterns needed to fit into a too small place so some important pieces were missing or if I am a bit too much beginner for the book but I do think it could have benefitted with some more sentences here and there. And more pictures. In fact I hope she makes another version with more detailed patterns more pictures and perhaps more patterns and twice as big a book. Hi, I left you a comment but am not sure you will see it. Courtney, Maui Jungalow blog. Hi Courtney:) The comments will not show until I publish them so your comments should show now. Thank you for thinking the baby booties are cute, aren't all baby things cute? She did, I must go by and say thank you to her, how nice. I like crafts too. You live on Hawaii? Cool :D What type of craft do you do? I must look into your blog later. Hope you will like following my blog.